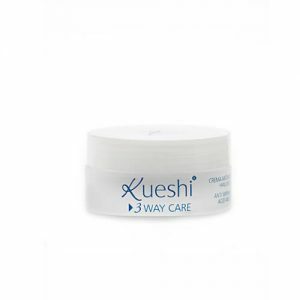 Combats dark circles, wrinkles and illuminates the eye contour area. Anti-wrinkle and anti-dark circles treatment with illuminating effect. Reduces dark circles and provides brightness immediately, thanks to its decongestant, soothing and stimulating action. It is a powerful moisturizer and protector of fragile eye contour. Leaves your skin soft, firm and luminous. Furthermore, the combination of active ingredients makes it an effective long term treatment to minimize bags, reduce wrinkles, crow’s feet and firm the area around the eyes for a radiant look. Principal ingredients: Artemia Extract, Calendula Officinalis Flower Extract, Centella Asiatica Extract, Ginkgo Biloba Leaf Extract, Caffeine, Vitamin A, Vitamin E.
How to use: apply on clean skin morning and night. Take a small amount of product with the spatula. Placing in the eye area and apply fingertip ring by gently pat, without dragging the product until fully absorbed. Precautions: External use only. Do not eat. Avoid contact with eyes, in case of contact with eyes, rinse with water. Keep away from children. Parabens free. Dermatological and ophthalmological control tested.